This sensory activity will have participants playing with water and learning about some different concepts at the same time. This activity is perfect do do outside on a warm summer day or can be done inside using a sink or a bathtub. The benefits of doing this activity outside is it is an easy clean up and can be quite refreshing. “Will It Float?” is an easy and fun activity to do with multiple different items. This list of materials and instructions are a guideline, but can be customized based on any water toys you may have or other household items laying around. While adding different things to the tub of water, make sure to continue talking about what is going on and asking lots of questions. Fill up the water container with room temperature water. Place two cups in the water, one with a hole and one without a hole. Place leaves in the water. Place coins in the water. Put a crayon in the water. 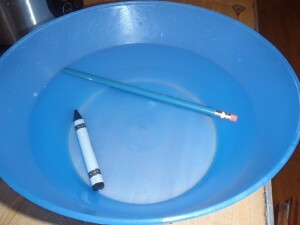 Put a pencil in the water. Look at what happens to the items. Do they float or sink? – A fun related activity involves freezing water balloons. Once frozen, the balloon can be removed and the shape still remains. Small toys can be frozen inside the water balloons and then thawed out in the tub of water. -You can also have other containers of warmer or colder water and discuss what happens when you add them to the main water container. Do you think this will float? Is there something we can do to help make it float? Is there something we can do to make this sink? Why do you think this sinks? Do you think something heavy would sink or float? Why?